From left to right: Blanca Jimenez-Cisneros (Director, Division of Water Sciences, UNESCO), Hubert Savenije (President, IAHS), Xia Jun (IHP/Volker medallist) and Bruce Stewart (Director, Climate and Water Department, WMO) (Photo by Wovencontent). Prof. Xia Jun graduated from Wuhan University (WU), completed his PhD on Hydrology in 1985, and has been Professor of Hydrology and Water Resources since 1991 at the same university. He has been the Chair Professor & Director of the Key Laboratory of Water Cycle in the Chinese Academy of Sciences since 2000, Director of the State Key Laboratory of Water Resources & Hydropower Engineering in China (2002-2006), and Dean of the Research Institute for Water Security. Promoting the hydrological science basis for sustainable water utilization by developing a nonlinear time-variant system approach and sustainable water management policy as an engine for social & economic sustainable growth. Promoting a new paradigm for a water system approach in large basins to deal with conflicts in the operation of flood control & environmental protection, and ecological operation in river system of developing countries. Playing a leading role in professional water institutions such as IAHS, IWRA, WWC, which have contributed to improved water governance in the world, particular in China. Prof. Xia made substantial contributions to improving cooperation and collaboration between water professionals from China and the rest of the world. In his roles as Vice President of the International Commission for Water Resources System of IAHS (1996-1999), Vice President of IAHS (2004-2007), President of the International Water Resources Association (2010-2012), and so on, his contributions to North-South and South-South knowledge and experience transfer have been very significant. Prof Xia Jun also had an immense impact on the formation of water resources managers and hydrologists. As a teacher, he has educated and influenced a new generation of water professionals who will undoubtedly contribute significantly to efficient and equitable management of water in China, both in terms of quantity and quality. He has an impressive list of publications with 420 technical papers and 30 books he edited, both international and Chinese. These have had major impacts on improving understanding of hydrology, and water and environmental management practices in many parts of the world. In summary, Prof. Xia is an outstanding scientist, whose innovative work on developing knowledge and strategies in hydrologic sciences and its application to water management and sustainable development in China and the world has made a major contribution to the international society. 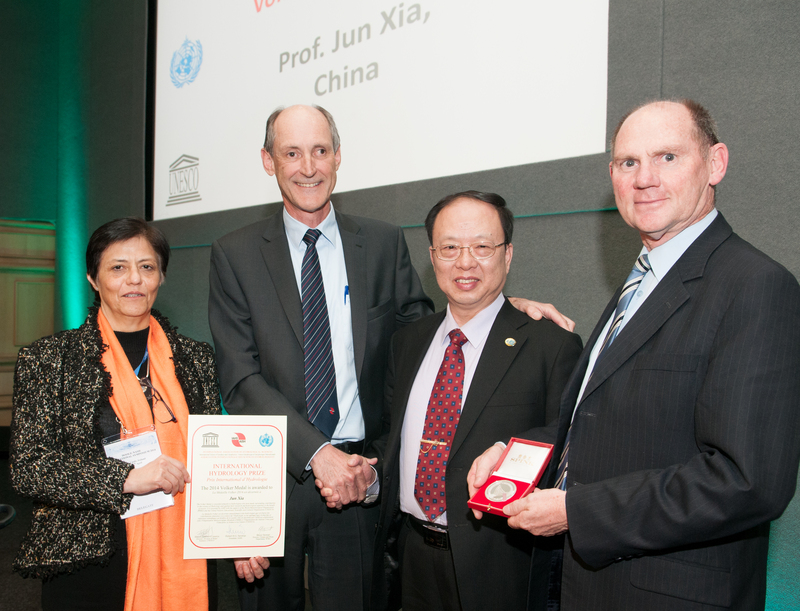 Prof Xia Jun is the first to receive the prestigious Volker medal of IAHS/Unesco/WMO. I am glad to say that he is an excellent person to lead the Volker medal dynasty that will hopefully follow him, and to serve as an example to the hydrological community in the spirit of Prof Adriaan Volker, who like Xia Jun was very much dedicated of bringing hydrological science into practice for the benefit of society and the developing world in particular. It is an honour to award the first Volker medal to Prof. XIA Jun, for outstanding contributions to the science of Hydrology and application of his research and hydrological expertise to the benefit of society. Today is a big day! 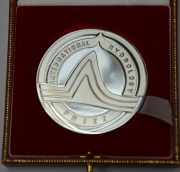 It is a great honour for me to receive the illustrious International Hydrology Prize this year, and in particular to be awarded the first Volker Medal from IAHS, UNESCO and WMO. I am particularly delighted that this is happening in the presence of this esteemed gathering, and in Ireland, a beautiful country with beautiful people, for whom I have a deep feeling of friendship and cultural affinity. To give one prominent example, since 1989 I have had the chance to work with and learn from two famous international great masters on hydrology, Professor Eamonn Nash and Professor Jim Dooge at Dept. of Eng. Hydrology, University College Galway and University College Dublin. Dear Hubert, thank you very much! I am truly humbled by the generosity of your kindly awarded citation. I really appreciate this recognition by the highest authorities in our field of the work done by me and my colleagues on establishing a hydrological scientific basis and the nonlinear time-variant model for sustainable water utilization and water policy; developing a new water system approach in large basins to deal with on conflicts over the scientific operation of flood control and water environment protection in densely clustered water projects, and eco-water operation in the river systems of developing countries; and promoting major professional water institutions like IAHS, IWRA, WWC and water-related activities like World Water Congress, which have contributed to improved water governance in the world, especially in China. I took up the study of hydrology and water issues in 1978, more than 35 years ago, right after higher education had reopened after the Cultural Revolution. It was a time of new beginnings, and I wanted to contribute all I could to China and the world at large through this research. Your award today makes me feel that in some way I have done that. Of course, I did not do it all alone. It is a personal achievement, but it also is a tribute to my colleagues and co-workers and to those closest to me who have supported me over the years through their generosity of spirit. Water is central to all development goals. I also like to say that hydrology is the foundation for wisely managing water in the world because it can explain scientifically hydrological processes and major system behaviour of the water cycle as it varies over time and space at the basin and global scales. This knowledge is directly linked with the prediction of water disasters, flood control, water allocation and complex water system operation and management. However, as we face ever more serious water security issues in the world, particularly from developing countries, such as extreme flooding and droughts, water shortage, water pollution and eco-system degradation, transboundary conflicts, food security, energy security (all related to water)- we must say that Hydrologic Science and its practice still faces big challenges to understanding hydrological laws appropriate to a changing environment. Particular challenges arise from hydrologic system complexity, uncertainty, integrated water system issues related to coupling hydrological physical processes with biological and bio-chemical processes and human dimension process, and the issue of decoupling. I suppose a central theme of my research has been to develop and apply system hydrology and its practice in addressing sustainable water management in China and developing countries. I think my achievements are first of all due to my early Ph.D Supervisor, Prof. Ye Shouze from Wuhan University, a famous Professor of hydrology who led a key national key research project on “Theory and practice of storm floods” just after a big flooding disaster in August 1975 in Helan-Ban-Qiao, along the Huai River, that claimed 26,000 victims and caused great economic property losses. Under this project, in 1978, I began to research nonlinearity of the hydrological system related to water project security, short term and high intensity storm floods forecasting, and water issue uncertainty. I received the first PhD in hydrology ever awarded in China, in October 1985. I would also like to thank very much Prof. Eamonn Nash, Prof. Kieran O’Connor, and also Dr. Raj Kachroo, Dr. G C. Liang and other Irish friends at the Dept. of Eng. Hydrology, UCG, for providing me a good opportunity to attend the International Workshop of River Flow Forecasting in 1989, 1995 and 1999 in order to develop and test the hydrological nonlinear system approach that I developed in China on more than 60 different basin data sets and quite different climate zones around the world, collected by UCG. I benefited very much by listening to several top level lectures by Prof. Jim Dooge on System Hydrology and had many fruitful discussions with him during the workshop. I also must take this opportunity to thank my Chinese Colleagues and friends, such as Prof. Liu Changming and others, in particular those from Wuhan University, Hohai University, the Chinese Academy of Sciences, NSFC, MOST, the Bureau of Hydrology, the Ministry of Water Resources, to name a few. I thank the Chinese National Committee of IAHS, especially Prof. Zhang Jiangyun who is President of CNC-IAHS and Academician of the Chinese Academy of Engineering for his support and nomination of me as a candidate for this wonderful prize. I also thank a number of influential international organizations, such as IAHS, UNESCO, WMO, IUGG, IWRA, WWC and GWSP for your kind encouragement, support, and cooperation on international activities. I make particular note of IWRA, where I am the immediate Past-President, which is developing some global water security strategies and international activities on sustainable water management through hydrological sciences and practice. Lastly, I would like to thank my wife, Ye Ping and my family, for their constant great love and support. Well, I receive the Volker medal today, based on past accomplishments, but I think and hope this is only the beginning of a new chapter for me. I look forward to being actively involved in the next IAHS Decade on ‘Panta Rhei - Change in Hydrology and Society’ which will be a wonderful opportunity for IAHS to create a new development and scientific strategy that will be benefit society and move the science of hydrology further forward. I will continue to work with you on hydrological science and its practice, and will make use of more international platforms to promote the development of hydrological science in the world. In closing, I one again want to thank IAHS, UNESCO and WMO for honouring me with this great award, and I thank you all for being here to share this afternoon with me.